I came across some interesting research on the plane to Amazon Web Services reinvent 2017 in sumologic’s The State of Modern Applications In the Cloud report (it’s a PDF but kudos to sumologic for avoiding a regwall). The data is based on production telemetry from 1500 of sumologic’s biggest customers. 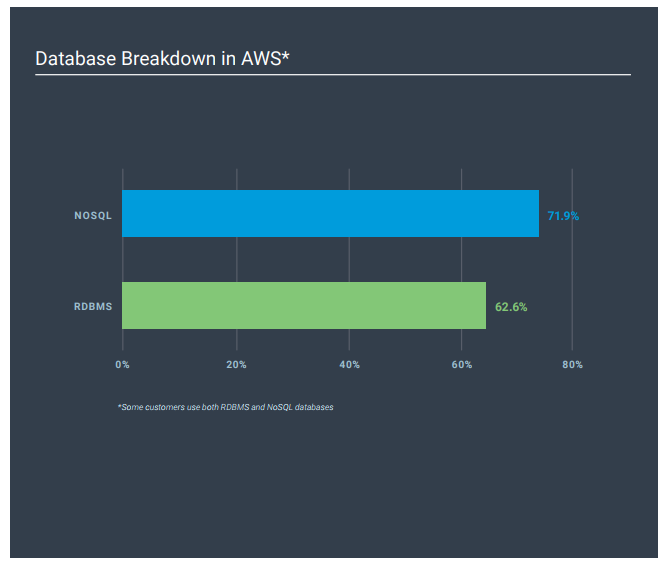 One nugget is that NoSQL workloads have now overtaken relational at AWS. This transition shouldn’t surprise us – NoSQL continues to make an impact because of ease of use and convenience for developers. IT tends to grow in layers- this won’t be because of replacement of relational databases, but rather new workloads targeting new platforms. We can of course expect to see a fair bit of NoSQL stuff this week, but Amazon is also touting Oracle migration, and new functionality in Aurora for Postgres. Other points of significant interest are found in containers and serverless. AWS Docker adoption has gone from 18% of customers to 25% in 2017. As sumologic comments, this indicates microservices are gaining a strong production foothold in the industry generally and AWS specifically. Lots of people are expecting some Kubernetes news this Reinvent. For me one of the most interesting aspects of AWS’ adoption of containers is that is now leading to engineering changes to suit the new model, in for example container networking – namely Task Networking for containers, announced a couple of weeks ago. AWS Lambda is also being widely adopted – in 2016 12% of customers were using it. Today that figure stands at 23%. Lambda was already showing marked signs of hitting an S-curve at Reinvent 2016, and we can expect further acceleration. There are just so many ways to use Lambda with other AWS services. So that’s some data as a teaser for this week’s news. I am looking forward to a fun and information packed week at Reinvent 2018. AWS is a client and is paying travel and expenses.